The Fire Yogi is a 47 minute documentary exploring a Yogi who has the extraordinary ability to use a unique breathing technique to get into union with Fire. 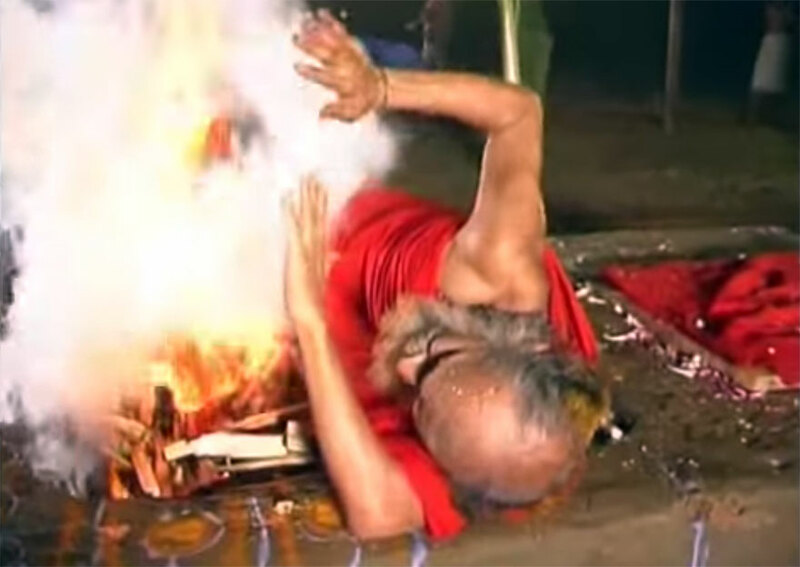 This documentary portrays a rare and unusual Fire Ritual performed by the Yogi and the subsequent chemical analysis of his clothing & physical tests that examine this supernatural phenomenon. 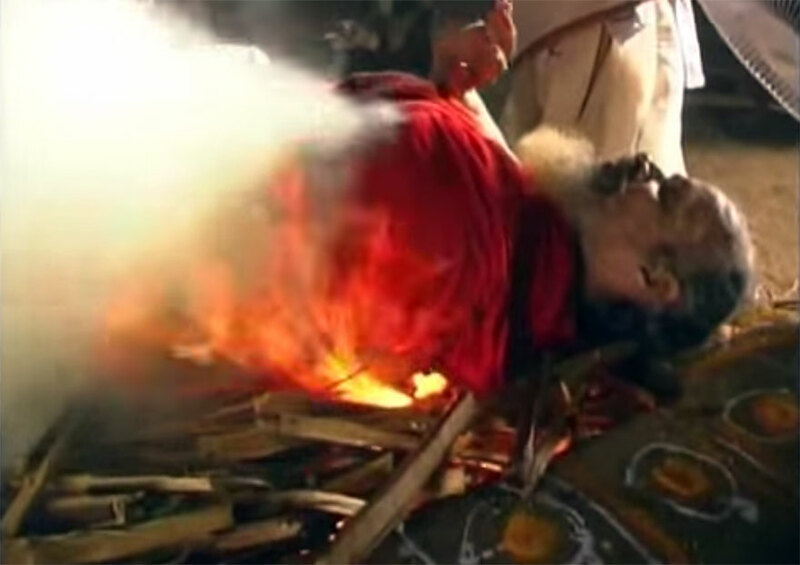 The Yogi has performed this Fire Ritual for a total of 1000 days over the last 45 years. The Yogi, weighing a mere 94 pounds (43 kilos), has been able to survive on only two bananas and a mere glass of milk with a few drops of water twice a day for the last 28 years. Many aspects of the Yogi are on the edge of unbelievability, while at the same time highlighting the power and endurance of human mind, body and spirit. Yogi Rambhauswami, the 63-year-old yogi, claims that in 1975 he stopped drinking more than a few drops of water each day, that two years later he began limiting his daily diet to a banana and a cup of milk, and that he sleeps only three hours each night. By all rights the Sanskrit scholar should be malnourished and dehydrated, but in director and producer Mike Vasan’s documentary, he appears to be a relatively normal, if somewhat slender, senior citizen. Rambhauswami’s real claim to fame, however, is his elaborate fire ritual. The ritual begins with his taking a bath, then moving on to meditation, pranayama, and a ceremony honoring Ganesha. The fire portion of the ritual is conducted over a sunken pit, into which Rambhauswami offers rice, coconut, sugar cane, and gallons of ghee. As he’s doing this, he goes into a deep meditative state. He enters the blaze and rolls around, protected by only a wool shawl, and remains there, in the fire, for up to 10 minutes at a time. When Rambhau emerges from the flames, though, there’s little evidence that he’s just been charbroiled. Even his shawl is intact, its preservation credited to a protective aura. The shawl was later tested for fire retardant, and results showed that the material hadn’t been treated. I belong to Tanjore and I want to meet this person. I pray to swamiji to train dozen students to attain the same status as he has attained through sadana and in the quickest posiible time. I also want the students newly being trained to spread the technique and criticalities of attaining this ststus to many an ordinary men in the society. I don’t doubt the achievments of the yogi. Rather I am concerned that this knowledge should be passed on to many an ordinary men in the society that may be of immense use at critical junctures. 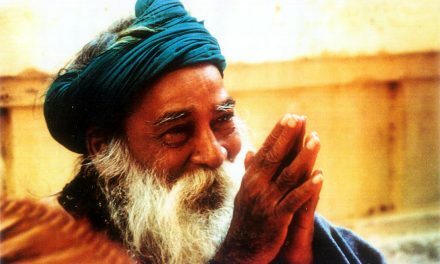 Om Shanthi. It is really nice to see and know about the powers of meditation of saints. I think that feats such as that performed by the swami are very relevant and important in this age of kaliy yuga when humanity in general is absorbed more in materialism than in spirituality. The feat awakens the awareness of the realness and existence of spiritual power and faith. Yogi doesn’t claim that he is God or demi-God. He is simply showing the people the power of yoga and meditation. People who criticise him are those, who cannot even bring in even a seldom of discipline in their life. Can these people wake up early in the morning and do a morning walk round the year, forget about doing any yogasanas. It is not easy to impart training to ordinary people. People have to be mentally strong and disciplined lot to learn yoga. Anybody can do it, but it needs practice and mental power. Rationalists and athists across the world need to meet our yogis to understand the true meaning of God. My guru Sri Mahananda Siddhar Meditates in the fire every day. Great. This is a part of yoga. Agni is one of the panch mahabhuts: akash, vayu, agni, jal, prithvi… by which the whole universe has been created. In the path to universal soul (parambrahma) one has to go beyond these five elements. this is God’s gift. there is another power superior to man. This is something fantastic. I am a writer in Tamil and would like to get the bio and other details of the yogi so that I can make out an article in Tamil for the benifit of the Tamil readers who are yet to know of this tremendous fete. My articles regularly appear every month in few spiritual magazines. May God give his whole ashirvadhams to Maha Yogi Shree Rambhavu Swamigal to prove this kind of Agni Yoga throughout our materialistic world. He himself made AGNI through his yogic powers. Pranams to Guruji on this GURUPOORNIMA DAY. I have seen his homa for myself and it’s indeed spectacular and just witnessing it itself is divine. Sit in meditation during his ‘agni pravesham’ and u will know how u feel. One has to experience this feeling to know what it is. He is full of love and I have never seen a guruji like him full of love and compassion. This yogi has attained the KAADI VIDYA SIDDHI, the supernatural ability to withstand extreme heat or extreme cold. Excellent. The Yogi has attained mastery over the element fire with the help of Yoga. There are very few such Yogis left who can perform such feats. Those who doubt his abilities should realize that he is not a street performer begging for alms. This act of this Great Yogi shows how rich our dharma is. It is really pathetic to note that now yoga is practised more abroad than in India. My Dear brothers: What do you think ? Yogi is fasting and staying without water just to show you a stunt which you do not believe? He do not care at all !!! Why he should do it for many years just to impress some people on some day or getting popular for one time? – Come on! Use your own common sense. Would you do it by yourself? Actually he is doing it to purify his own soul and make it sacred in this life,as per the teachings of his own Guruji. The variety of offerings in the fire is an old ritual of thousands of years, which was very popular in those days, for direct invitation to God and offering some special things, to please the invitee – a super natural power ( to get blessings and get help to save the soul for eternal life by a spiritual powers only through God.) All Godly force of invitees protect him through some spiritual vibrations & aura around him. After virtually feeling the presence of God, he want to be more and more nearer to God,shows his desire and love to be one with the God. Just like a child runs to a loving mother without looking the surrounding dangers, this Yogi wants to cross the fire line by submission of himself to the fire.We all know that he is not that successful crossing that line, which is difficult but not impossible by repeated practice. He is trying because he has felt and seen that in reality which we can not even imagine. Even if we can not see the flames surrounding him, but the burning coal in to a deep fire pit has a very very high temperature than just flame. Also, do you all know that, nobody touches him during that sacred ritual and if some one touches by an accident it is a big electrical shock !! – It is a big effort for him to come back in that sacred purity of fire. I know it and you find it out, also. Easy to say than do it. Please, respect and learn something from his example. We all are lucky to see this kind of yogi in this age of the earth. There are many proven rituals which practically take you to the God , Allah , Jesus or anything in which you strongly believe.I am looking forward to visit him and get his blessings when I will be in India next time. Nobody should miss a chance to get blessings from a devotee who is blessed by all mighty God.Usually I am not a blogger, but it is my duty as a human being to express what I beleive, so that some one can get something which he or she can chew on ! to analyse more and more for others who need a ready stuff to swallow. Elements of nature can be controlled by Yogis by their freedom from the same elements. I am from Tanjore also from Vishanampettai village near Thriukattupalli town. I wish i could have his darshan and his blessing to perfection. Namaskar! Only with constant sadhana can achieve such miraculous agni pravesha. Such knowledge cannot be just simply handed over to householders as such knowledge without the practice of Yama and Niyama especially akhand bhrahmacharya and aparigraha (non hoarding) can be destructive and can bring arrogance which is detrimental to union with God. It is important that householders all take sankalpa to practice all the 8 limbs of Yoga with discipline. I sincerely pray that maximum people get inspired by Swamiji to practice the sacred discipline of Yoga not only the asanas and pranayamas but aslo with all the Yams and Niyams. Pranam to the great saint. Thanks to your organisation for throwing light on such deeds. Hope to have darshan of such great vibhutis. You devoted more than 2 hours with me, by allowing me to worship your Great Guruji & Lord Uchishta Ganapathy along with you which I can not forget in whole of my life. Further you explained to me the Law of Karma & it’s consequence, when I narrated certain untoward incidents happened in my life ,particularly , my beloved wife’s sudden death on the Chitra Pournami day 06.5.2012. How Great , you consoled me & gave your Prasadams to me. I am still keeping the same in my Pooja room. Swamiji, you may remember me ,I handed over a Book ” MANADHIL MALARDHA MALARHAL” written by my wife Thirumathy Thilakam Ramachandran for your kind perusal. I will be 76 on 10.8.2015. I humbly request you to bless me for a peaceful life. I BELIEVE IN SPIRITUAL THINGS. ” NOTHING CAN IMPOSSIBLE IN OUR SCIENCE.”PURE SCIENCE”.ACTUAL MEANING IS PRACTICAL …..THIS IS POSSIBLE THROUGH IN PURE SCIENCE.NOTHING TO SAY.NOT FOR ANY WONDERFUL THING.LIKE REGULAR SADHANA IS MUST& UTLISE THE ABLITY /POWER OF MIND. Such technics are possible with Yogic sadhana with utmost sadhana. One should not think that the Yogi had done it for canvassing. He is performing to show the greatness of spiritual yoga. Such Yogis are not either God or demi-God. We will respect him and honour his ability to do. Now-a-days some are trying to project themselves as God with some technique. Some devotees are worshipping such people while constructing temples. God or demi-God are only to be those mentioned in our traditional Puranas. Where are temples for Saints, Yogis and Maharshis? They are not bothered for all such matters.They are very much interested in Dharma sthapana. We all to pay respects to Fire Yogi and such others. In Tanjavoor, (Tamil Nadu), adjascent to Brihadeeshwara Temple, there is one Uchchishta Ganapathi Temple. Rambhav Swami lives there. This is one of the many possibilities of Yogic Sadhana, which remains only a folklore today. We all know Bishma had lived on bed of arrows without food for so many days and narrated so many sermons scripted in Mahabharata. The fire enduring feat is no small thing by any means, my salutations to the revered Swamiji, he has attained this level of will-power by his sheer devotion and dedication. to his feet. God bless him with power of Prana sadhana. wish which is proved by the Swamiji. Thanks to your organisation for throwing such deeds. Hope to have darshan of such great vibhutis. it is great and kind for all such article i receive from you..
pranaam guruji !! wish to have your darshan and seek your blessings. pranam to the Pujya swami ji. This is the power of our great religion-Hinduism. Nothing is impossible when you have devotion, dedication,discipline and God’s blessings to achieve things which are beyond ‘normal’ human level. With pranams to swamiji. I am from Tanjore. I will meet him personally when possible. Encourages every one to understand power of yoga and the great secrets which may not be visible to our eyes until we too find a great guru . With all due respects to Rambhau Swami and Indiadivine to publish such an article. Looking forward for more such articles..which can force us to think beyond our normal perception..
My sincere pranamam to Swamy, we are all indebted to swamy because in spite of possessing the miraculous power and yet not commercializing the same. We are all lucky enough to have him in our country, which enables us to have his darshan. once again pranamam. I am very amazed as well as pleased to have an opportunity to at least visualize the puja performed in a documentary manner. My life will be blessed if I could ever be able to meet Swamiji in person. My namaskarams to the great yogi.i wish to have his darshan. Pranam to guruji, we are blessed to have you among us, most importantly at this age of kaliyuga when people are only greedy & running like mad behind the materialistic pleasures forgetting what we are & what we possess & what gift God has given us. In short sometimes in between the busy hour’s of daily life I just go to my childhood days flash back when people were so honest, sincere, loving, caring & helpful but now these are mere words having the meaning but no essence of it. My love to all those people who respect mankind & the creation of God. Interesting stunt. But don’t make him God or another Guru…we already have enough Gurus. wow.. this is the power of one’s devotion. Great Yogin! Amazing feat! 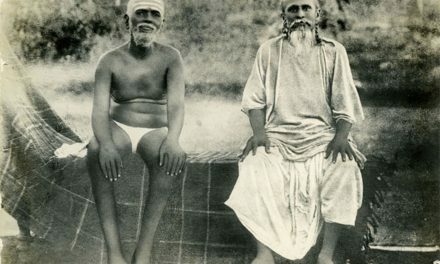 I read that Sri Rambhau Swamiji had much Experiences with Kanchi Maha SwamigaL. it will be nice to meet Him and hear from Him those Experiences!Hara Hara Shankara, Jaya Jaya Shankara! Does Swami Rambhau heal people? My child is very sick and the medical doctors have no treatment available for him.